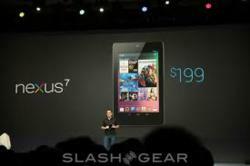 Google Unveils their Nexus 7 Tablet but will Apple Still Dominate the Tablet Wars? Google released news of their Nexus 7 last Wednesday and promises that it will make an impact in the tablet wars. Can the Nexus 7 prevail where all others have failed in the tablet competition? With Wednesday's launch of its Nexus 7 tablet, Google gives the current tablet market a much-needed jolt of energy. Google has entered another arena of technology with the release of their new Nexus 7 tablet which should give Apple some hefty competition. With a new Android 4.1 Jelly Bean operating system, the Nexus 7 is predicted to prevail where all other tablets have failed in the past. How can the Nexus 7 Compete with Apple? "The Nexus 7 is the tablet that Google should have launched with a year ago. The Nexus 7 packs a high-performance, no-compromise set of features at attractive prices–$199 for the 8GB model and $249 for the 16GB model. Manufactured by Asus, the Nexus 7 tablet represents the first commercial manifestation of Nvidia’s Project Kai. Nvidia designed the Kai reference platform to provide manufacturers with a shortcut blueprint of how to create a competitive tablet at consumer-friendly pricing." A representative of BillionairesBunker.com states that Google realizes the importance of tablets because they keep business owners and regular consumers connected with everything they need at any given time. Since Apple is pretty much dominating the world of tablets, the Nexus 7 will offer different options and possible phone technology as well. Will the Android 4.1 Jelly Bean Operating System Give Apple a Run for its Money?